The twinflower is one of Scotland’s most iconic wildflowers, an emblem of Scotland’s ancient Caledonian forests. However, it is a plant under serious threat and innovative work has been undertaken to ensure that the Cairngorms National Park is a stronghold for the remaining population. 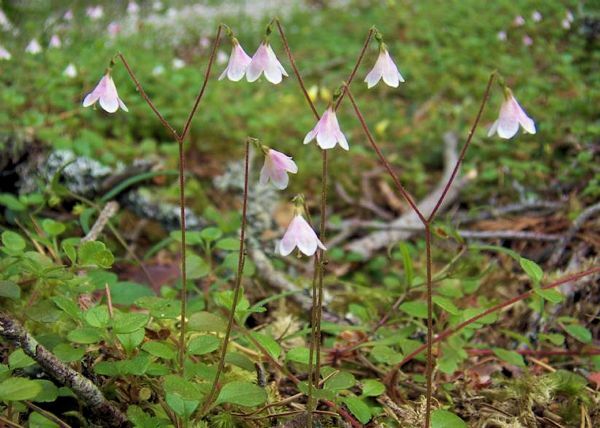 The twinflower’s natural habitat is native pine woodlands and loss of its habitat has resulted in patches of the flowers being too far apart to be able to successfully pollinate. An innovative project has been put into action to help overcome this problem. The Cairngorms Rare Plants Project was launched in March 2010 to deliver urgently needed action for four threatened plants of high conservation importance in the Cairngorms National Park. This project is a partnership between the CNPA, Scottish Natural Heritage and the University of Aberdeen. Past fragmentation of native pinewoods has meant that the distances for pollinating insects to travel between patches of the twinflower are too great, meaning they have not been able to set seed. The project developed innovative new translocation methods to move carefully selected plants closer to existing patches of the twinflower. The aim is to facilitate cross-pollination and seed production between the plants and ensure the long-term recovery of the flower. This pioneering project, alongside objectives to expand the area of native pinewoods in the National Park, should help ensure twinflower populations will be safeguarded long into the future. The Cairngorms Rare Plants Project has brought together land managers, key conservation partners, rangers and local volunteers to work together to save this special little flower. It is an excellent example of how groups and individuals can come together to make a positive difference to conserve the amazing nature we have here in the Cairngorms National Park.